Peel 3 peaches and cut into slices. Soak them in a jar (or two) with bourbon. You only need to soak them for about 20 minutes as they take on the strong bourbon taste quickly. While they’re soaking, press one pie dough into an 8 x 8 pan. Strain the peaches. In a bowl, add brown sugar, corn starch, cinnamon and vanilla in a bowl and stir until combined. Arrange the sugary peaches in the pan, then scoop some of the remaining juice onto the peaches. With the other pie crust, lay it out on a cutting board. 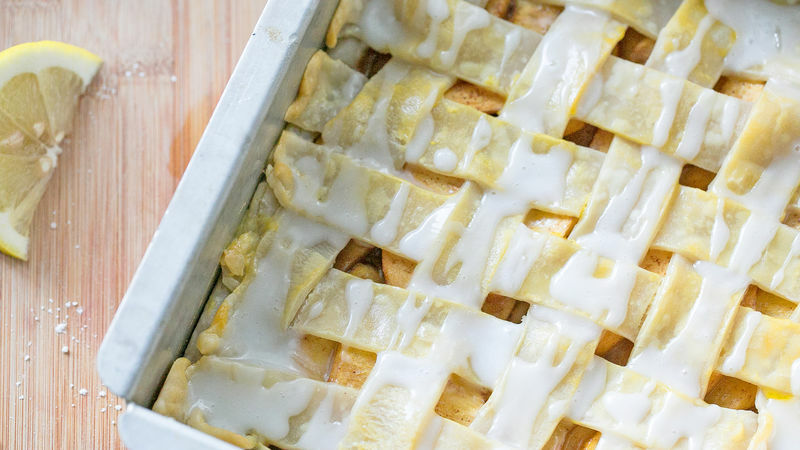 Cut strips to make a lattice pattern on the top of the peaches, just like an old fashioned pie. Brush the top of the crust with an egg yolk mixed with a teaspoon of water. In a small bowl, combine powdered sugar and lemon juice and stir until it’s the texture of a glaze. Once the bars are cooled, drizzle the glaze over the top. The saying “easy as pie” fits these bars perfectly! In honor of National Peach Day, I’ve created a very simple recipe for some darn good peach pie bars. The secrets to this recipe are 1) soaking the peaches in bourbon, then when the pie is done, 2) drizzling an insanely delicious lemon glaze over the top. These won’t last long at your next party! To get started, preheat the oven to 375 degrees F.
Peel three peaches and cut into slices. Soak them in a jar (or two) with bourbon. You only need to soak them for about 20 minutes as they take on the strong bourbon taste quickly. While they’re soaking, press one pie dough into an 8x8 pan. Strain the peaches. In a bowl, add brown sugar, corn start, cinnamon and vanilla in a bowl, add the peaches, and stir until combined. Arrange the sugary peaches in the pan, and then scoop some of the remaining juice onto the peaches. Lay the other pie crust out on a cutting board. Cut strips to make a lattice pattern on the top of the peaches, just like an old fashioned pie. Brush the top of the crust with an egg yolk mixed with a teaspoon of water. Bake for 20-25 minutes.